The son of Taiwanese immigrants, Yang was born in upstate New York in 1975. He gained his education at Brown University and Columbia Law School. After success in the business world, Yang founded Venture for America, an organization that helps entrepreneurs create opportunities nationwide. In 2012, he was recognized for his work with VFA by being named a Champion of Change by the Obama White House and in 2015, he was named a Presidential Ambassador for Global Entrepreneurship. 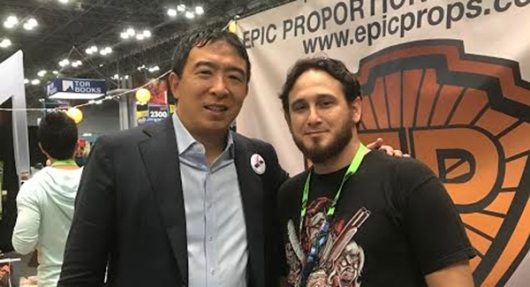 I met with Andrew Yang to find out more about his presidential platform, how he hopes to help Americans, and why he was at NYCC. Geeks of Doom: My day job is a history teacher and I write for geeksofdoom.com afterwards, so meeting a presidential candidate at Comic-Con is like the intersection of everything that I am. So I guess I’ll start with the general question, what made you want to run for President of the United States? Andrew Yang: Well, I spent the last seven years helping to create thousands of jobs in Detroit, Cleveland, St. Louis, and other cities across the country and I realized that we’re eliminating jobs in most of the country much faster than we’re creating them and in my opinion that’s why Donald Trump won in 2016. We automated away four million manufacturing jobs in Michigan, Pennsylvania, Ohio, and the swing states that he needed to win. And so I realized that no one in our political establishment was going to even acknowledge that that’s the central problem, that we’re in the midst of the economical and technological transformation in history of our country much less offer any meaningful solutions. I said someone needs to do that and that’s when I decided to run for President. Geeks of Doom: You mentioned the increase in technology and while researching you, I read you were endorsed by many futurists. I feel many of our politicians today have their shoes stuck in the past. Why do you put such an emphasis on the future and technology when looking at politics? Andrew Yang: You know Danny, I’ve started calling myself a “present-ist” because if you say “futurist” it sounds like you’re talking about some far off future, but we have to wake up. Autonomous cars and trucks are going to be here as early as next year. Artificial intelligence is real, coming online and is set to eliminate millions of call center jobs. None of this stuff is speculative anymore. Even the elimination of manufacturing jobs brought our labor force participation rate down a multi decade low of 62.9%, the same levels of EL Salvador and the Dominican Republic right now in year ten of an expansion. So the temptation is to think that all these things are coming down the pipe, but the truth is we’re in the middle of it and we’re dealing with it in the worst way possible, which is to pretend it isn’t happening. But you’re right, because if you look at D.C. as a culture, they are decades behind. Donald Trump was born in the 1940s. Unfortunately many of the front runners in the Democratic party are also born in the 1940s. So thinking they’re going to have really clear solutions to our problems in 2018 or 2020 is unrealistic and that’s another reason I am running for President: to bring our government and our society into the 21st century. Geeks of Doom: While I was sitting here, a young Asian fan came by and I heard him say how exciting it was to have an Asian-American running for President. I remember in 2008, Barack Obama, a young, charismatic, diverse politician, was able to galvanize Democrats and the Democratic party. Do you see yourself being able to do that in a similar way to Obama? Andrew Yang: Well, I’m proud of both being Asian-American and being the first Asian-American man to run for President as a Democrat. I certainly hope that I can generate the same level of excitement and enthusiasm in people across the country that Barack Obama did. I remember vividly in the build up to 2008 that if this guy became President we’d be so much better off. If I have the same sort of arc or impact, I’d be excited with the caveat though that I’m running less on a platform about me and more about how we need to implement meaningful solutions to the fact that we’re going through historic changes because the center of my platform is a freedom dividend of $1,000 for every American adult per month. In my mind that would mean much much more to the American people than the optimism amongst some people of having someone like me become President. Geeks of Doom: I was going to ask about your platform and I was reading that you got the idea for the freedom dividend from your love of science fiction and that brings us back to Comic-con. Why do you think this will be something that American people will go for? It’ll help me, so I support it. Andrew Yang: It will help a lot. You’re a teacher and you know many teachers are working second jobs to make ends meet. I didn’t get the idea for the universal basic income from pop culture, though it’s clearly the case in a Star Trek universe and other places that people are experiencing a society of abundance or something similar to universal basic income. But universal basic income has its roots in the founding of America where Thomas Paine was for it. Later, Martin Luther King was for it, Milton Friedman was for it, and a thousand economists signed a letter saying it would great for the economy and society in the 1960s. It passed the House of Representatives and almost became law. The reason I am so convinced about universal basic income is from all the work of technologists and union leaders who see that human labor is becoming less and less central to the economy and companies are realizing they can be very successful without hiring lots of people or paying them well. But I am a genuine geek in that I grew up on Marvel comics. Star Trek: The Next Generation was when I really got into Star Trek and it is true that one reason I’m here today is that geeks and science fiction fans understand what the future can look like and that a better future is possible if we just push in that direction. Geeks of Doom: Well, you won’t find a more diverse and progressive group of people than here at New York Comic-Con, so running as a Democrat, I think you’re hitting your core audience. Andrew Yang: I definitely feel like I’m in the right place, and meeting fans here is a lot fun. It was definitely interesting and unabashedly cool to interview a U.S. Presidential candidate. Mr. Yang is young, intelligent, forward-thinking, and gracious in a way many of our current leaders on both sides are lacking. You can read more about Andrew Yang, his political platform, and the freedom dividend, as well as make contributions to his 2020 campaign on his website and check out his announcement video here below. Hopefully Mr. Yang will be back at NYCC each of the next two years building his voter base before the next U.S. Presidential election.